Child-friendly? As family-appropriate a film as they come. If you haven't seen it already, Puss in Boots' high profile at the 2012 Academy Awards may have landed this film on your family's radar recently. A prequel to the immensely popular Shrek, the movie was nominated for Best Animated Feature Film – just missing by a narrow margin to Rango. Despite this, you might be wondering how deserving Puss in Boots is of such praise, considering it's the fifth feature film continuation of the Shrek franchise. After all, essentially any halfway decent animated film of the year will be nominated for its genre at the Oscars (2007's Surf's Up, I'm looking at you). While the original Shrek was an outstanding movie that appealed to children and parents alike, the subsequent spinoffs lost a significant amount of steam along the way (in case you had any hopes of the franchise recapturing its earlier magic, consider the television holiday specials Shrek the Halls and Scared Shrekless – two films that likely took all of five seconds to produce). At this point, it seems like Mike Meyers and co. are just in it for the paycheck – after all, let's not forget this is the same guy who wrote and starred in The Love Guru. However, it's doubtful that your children will share your skepticism going into Puss in Boots. 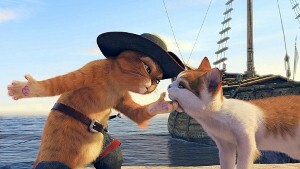 To them, any excuse to revisit their old friends – though Puss in Boots (voiced by Antonio Banderas) is really the only returning character – is worthy of a trip to the theater. You can also expect the old one-liners, toilet humor and child-friendly slapstick that characterized the earlier films to be back with a vengeance. As a prequel, Puss in Boots chronicles the titular feline's adventures prior to meeting Shrek and Donkey in Shrek 2. The film opens with Puss in Boots and his two sidekicks Humpty Dumpty (Zach Galifianakis) and Kitty Softpaws (Salma Hayek, naturally) in pursuit of the magic-bean-obsessed outlaws Jack (Billy Bob Thornton) and Jill (Amy Sedaris). The dastardly duo's intentions are to use the beans to reach a giant's castle above the clouds and steal his golden goose eggs. Along the way, Puss and his friends encounter all manner of fairytale creatures and misadventures. While the film's style is largely more of the same from the Shrek franchise, Puss in Boots is actually a step up from the other spin-offs. The dialogue and humor is witty in the way all children's films should be – appealing to children with many subtle prods to adults buried within the jokes. Would we prefer to actually Hayek on the big screen instead of listening to her? Of course. Until then, this will do. Child-friendly? During a season when you might find yourself held captive watching Journey 2: The Mysterious Island or renting the latest installment in the Twilight saga, Puss in Boots offers welcome relief to parents and children looking for an old-fashion silly and fantastic adventure.